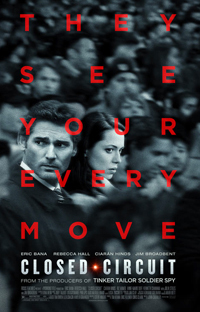 From the producers of TINKER, TAILOR, SOLDIER, SPY comes the new international thriller CLOSED CIRCUIT. Following a mysterious explosion in a busy London market, the police swoop in, a suspect is detained, and the country prepares for one of the most high-profile trials in British history. Two exceptional lawyers with a romantic past step into a dangerous web of secrets and lies, and when evidence points to a possible British Secret Service cover up, it’s not just their reputations but their lives that are at stake. The film stars Eric Bana, Rebecca Hall, Julia Stiles, and Jim Broadbent.